Oso, a 2-year-old German shepherd on the La Plata County Search and Rescue K-9 team, works his way through an obstacle course with dog handlers Rae Randolph, left, and Diana Bristol. Led by Eagle Scout hopeful Lukas Adamski, Boy Scout Troop 538 built the course. 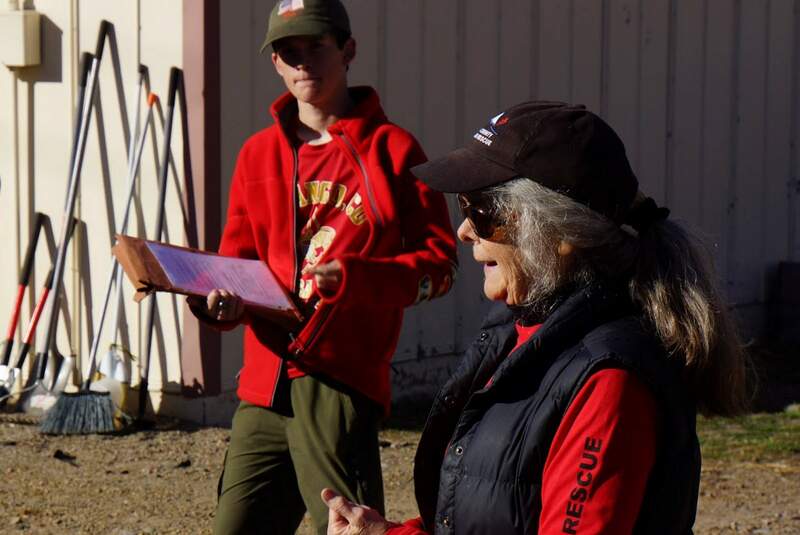 Boy Scout Lukas Adamski and K-9 team leader Katie Steelman organized the work crew that built an obstacle course for La Plata County Search and Rescue’s K-9 unit. 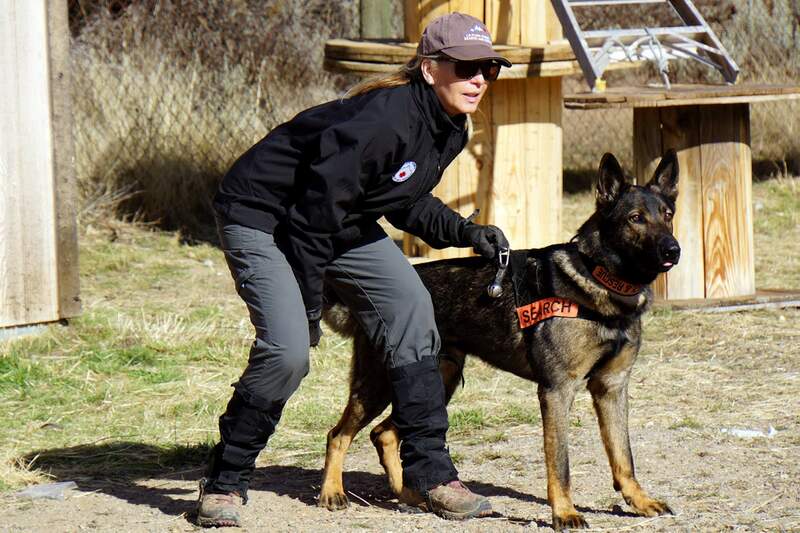 Dog handler Rae Randolph prepares Oso, a 2-year-old German shepherd, to test the new training course Boy Scout Troop 538 built for La Plata County Search and Rescue. The project was led by 16-year-old eagle scout hopeful Lukas Adamski. When emergency strikes, La Plata County Search and Rescue K-9s have to be as prepared as their commanders. So two weeks ago, Boy Scout Troop 538 spent a Saturday building a six-obstacle training course for the agency’s K-9 team, a project led by Eagle Scout hopeful Lukas Adamski, 16. Designed with the agency’s input, about 30 volunteers built the course in half a day at the “Rescue Ranch” on the corner of 32nd Street and East Animas Road (County Road 250). Local businesses and organizations, including Canyon Construction and La Plata Electric Association, donated building materials. As a self-funded organization, Search and Rescue couldn’t afford the luxury of a training course for K-9s. 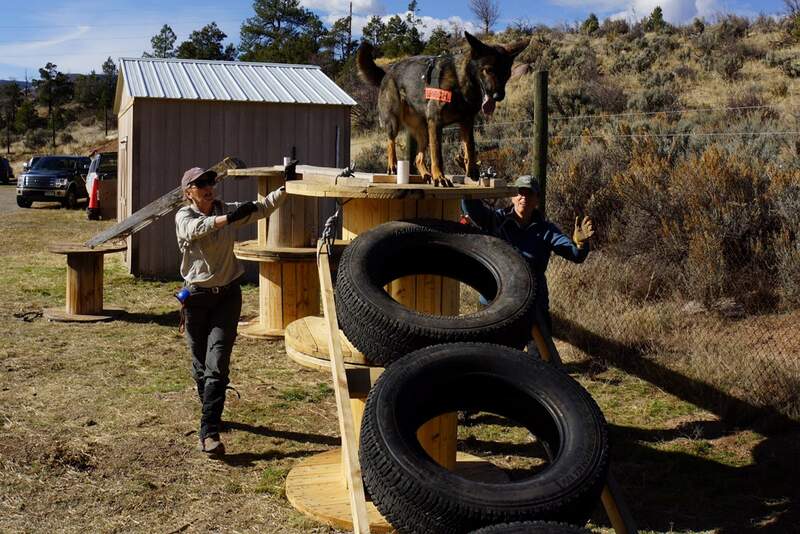 The course includes a seesaw, elevated plank, tunnel and other structures that simulate situations rescue dogs might encounter in the backcountry, such as searching a culvert or crossing a creek on a log. Adamski, fellow scouts and volunteers collectively invested about 250 hours. Search and Rescue has four K-9s as well as a puppy under evaluation to join the team. Steelman said future K-9s will be started on the course as puppies. And Adamski expects to get his Eagle Scout badge by spring 2017.